In God's Debris, best-selling author and creator of Dilbert Scott Adams fashioned a thought-provoking exploration of life's great mysteries (everything from quantum physics and God to psychic phenomena and dating) that quickly captured the attention and imaginations of readers everywhere. The intriguing story of a deliveryman who meets the world's smartest person and learns the secret of reality is threaded with a variety of hypnosis techniques that Adams, a certified hypnotist, used to induce a feeling of euphoric enlightenment in readers to mirror the main character's feelings as he discovers the true nature of the universe.Launched to coincide with the hardcover publication of its sequel, The Religion War (see opposite page), this first paperback edition of God's Debris will soon make the leap to a broader audience. 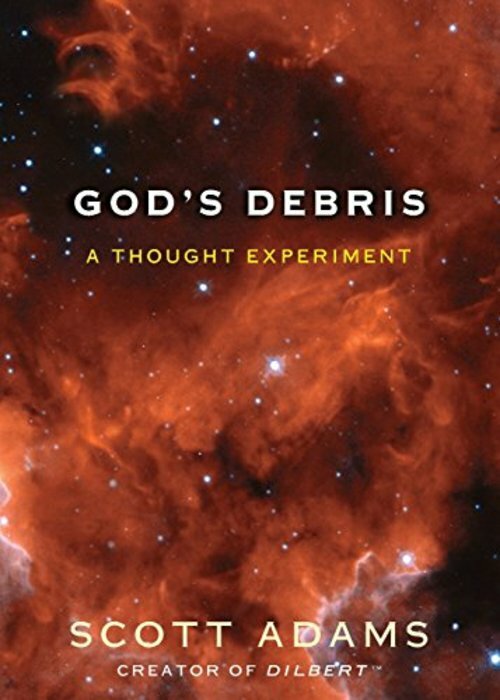 As Adams designed it, the book will "make your brain spin around inside your skull" and drive readers toward The Religion War as they seek to confirm or deny the dizzying impressions and chaotic memories of reading God's Debris.The book provides one of the most compelling visions of reality ever experienced on the printed page. Along the way, readers will enjoy the Thought Experiment: Trying to discover what's wrong with the sage's explanation of reality. This is a book, as Adams says, to be shared and savored with smart friends.